This will be a short posting but very powerful in its words and message. A young professional reached out to me for assistance, not just in seeking opportunities with my organization but getting their foot in the professional door of future growth and achievement. I was able to provide some advice, life lessons and words of encouragement to one of the newest additions to the workforce. This individual just reached out this morning and informed me that she landed an internship and full-time opportunity with J.P. Morgan and Ernst & Young respectively for the fall and spring. I want to share a good news: I bagged a summer internship with JP Morgan chase in their Operation and Business division and a full-time offer with Ernst & Young in New York. Life sure is rewarding, if you can hang on for long enough that is! THANK YOU SO MUCH…. As they say, We can never succeed alone. But steer our way through the various kinds of help we receive, big and small, from one another. Thank you for your words of encouragement and guidance through this journey!! 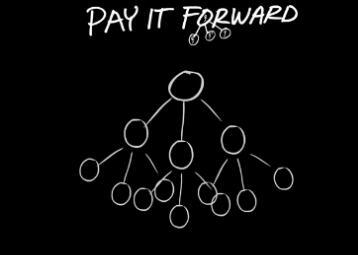 I will definitely pay it forward!! All the best, as you go ahead may the best come to you.. I look forward to keeping in touch. Though no personal gain was achieved on my end, I feel a sense of strength and fulfillment that can only be found in the eyes of another. Through my small part, I was able to assist her in finding the right path in life. Thank you for allowing me to share this story with you.